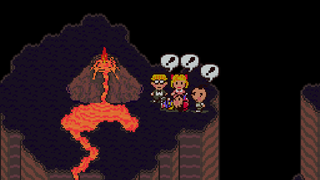 For quite a few years now, people have theorized that Nintendo would never re-release Earthbound in the United States because of licensing issues: the quirky RPG takes music from Chuck Berry and The Beatles, among other artists. But! Earlier this week, Nintendo announced plans to finally bring their Super Nintendo classic to the Wii U's Virtual Console. So we asked Nintendo director of product marketing Bill Trinen: was the music an issue? "Not that I'm aware of," Trinen told Kotaku's Kirk Hamilton during an interview in San Francisco on Wednesday. "So it'll be the same soundtrack as the original game?" Kirk asked. "Yeah, I mean, they're taking the original game and putting it on Wii U," Trinen said. So maybe those licensing issues weren't actually issues, or maybe Nintendo doesn't think Earthbound's samples are significant enough to draw any legal ire. Either way, this is exciting not just because people in North America and Europe will get the chance to play Earthbound legally without spending thousands on eBay, but because this is just about the first time in two decades that Nintendo of America has actually acknowledged that the Mother series exists. "It just seems like there's a lot of Earthbound supporters inside of Nintendo and inside of Nintendo of America," Trinen said, "and there's been a real big desire to try to bring this back for people that have been longing for it for a very long time. And so, we're just really happy that we've been able to do it. And we're gonna do it on Wii U, where it'll… because it's gonna be a Virtual Console game, it'll have its own Earthbound Miiverse community. Which is gonna be, I think, spectacular."